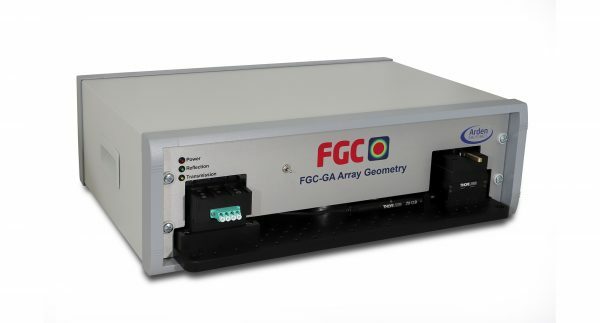 The FGC-GA is the ultimate solution for measurement and process control for V-groove array production. With one unit, users can measure V-groove block geometry, core-to-core pitch and core X & Y offset of multifiber arrays up to 15mm in width. With a 1200μm field of view as well as an automated lateral stage for scanning along the entire width of the array, the FGC-GA is the fastest and most flexible way to produce top quality V-groove arrays. The Arden Photonics darkfield illumination system allows the software to show a clear live image of the array. This allows users to inspect and image the front face of array, and take measurements of the V grooves themselves. The FGC-GA with image stitching can produce a full image of the entirety of the V-groove array in perfect detail. The FGC comes with an efficient software package containing controls to switch between reflection and transmission mode. This allows users to quickly and easily get both core and cladding geometry measurements including diameter, non-circularity and concentricity. The software contains measurement templates for all standard telecoms fibers, however users can also create their own. This allows the measurement of many special fiber types including dual clad fiber, bend insensitive fiber, multicore fibers and many more. Measurement of core to core pitch, X-offset, Y-offset and V-groove block geometry. Lateral adjustment stage and image stitching for measurement over a 15mm array width. Flexible software can adjust for different fiber types (SM, PM, MM). 1200μm field of view allows simultaneous measurement of up to 4 cores, decreasing overall measurement time. Arden Photonics custom array holders available depending on customer requirements. * Repeatability is measured on the FGC-GA using a single 500μm 3 single mode fiber array without removing it from the unit.